"In Tune with America" melds music and words to tell a story of hope � a hope that today's Americans will focus on the lessons of United States history: the significant events, the trials and tribulations, the outstanding leaders and heroic acts, all of them part of America's great story. This book is a gateway to better citizenship, showing how the United States has achieved its unique position in the world economically, socially and politically. It is also fun, filled with less-known parts of well-known songs, from all four verses of "The Star-Spangled Banner" to the lyrics of Tin Pan Alley. American music, like the American people, is rich and diverse. "In Tune with America" puts readers in tune with the American dream. George R. Nethercutt Jr. is a former U.S. Congressman who represented eastern Washington State from 1995 to 2005. He is founder and chairman of The George Nethercutt Foundation, a nonprofit, nonpartisan organization established to foster an understanding of government and public policies in young adults and create a new generation of principled leadership in America. 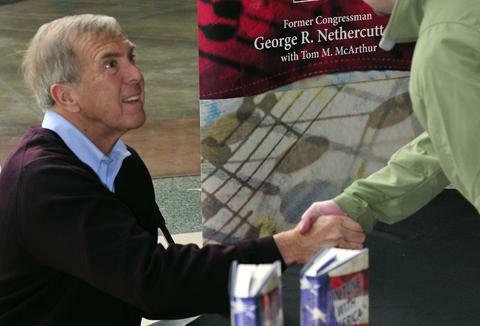 George Nethercutt Jr. shakes hands with a citizen during a book signing at River Park Square shopping mall in downtown Spokane. 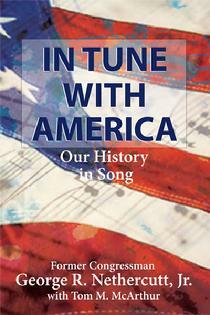 "In Tune with America" will be launched nationally on July 4, 2010.